"We had resounding success with a 99 out of 100 survival rate." “When we first started out in ‘95, we looked for a way to produce and ship healthy specimen trees 12 months a year to our contractors. We’ve been using High Caliper 21” specialty grade in-ground Root Control Bags for the past 20 years to help us do just that. We’re able to dig year round, be more economical by filling the bags with our own field soil, and in my opinion, foster a better marriage for growth when transplanting to our clients’ construction sites. 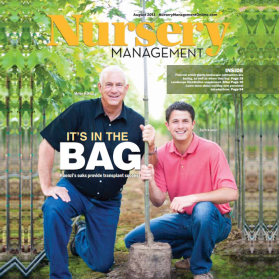 But the biggest benefit didn’t occur until some years later after we observed many of our customers experiencing high mortality rates when transplanting bare root varieties like burr oak, northern red oak, chinquapin, and beech. Through our knowledge of the bags, we knew we could help them. So, it was during this time we started using High Caliper’s 10” root control bag to produce these difficult tree types. We had resounding success with a 99 out of 100 survival rate. Not only that, but they’re even going to market about 2 years faster than bare root grown plants. This is due to High Caliper’s quality bag material and manufacturing process. Their fabric traps roots and prunes them, which other fabric bags on the market don’t do. Shipping in the bags may cost a little more, but when you do the business math of possible increased shipping vs the high survivability rate and production increase, it’s not even a question. In our discussions with some top industry growers, using the bags wins every time. The top 20-30% of the marketplace understands this and they just jump all over it. High Caliper has great products, they’re fine people - very service oriented and helpful, and I absolutely recommend them." "They are by far the most efficient way to produce trees." "We'd be lost without it. Everything improves: growing, harvesting, digging, hauling, and shipping." "Tree collars are very effective securing a tree in place on a cable when wind is a factor." “Even when compared to a pot grown tree of the same age, the above ground RCB-Pro grown tree had the best root system by far." "I’ve had tremendous results with the whole High Caliper product line..."
"Cherry Lake Tree Farm has been using High Caliper tree collars for about 5 years on our large container trees"